Charles Dickens first visited the United States and Canada for six months in 1842, arriving in New York City with his first wife Catherine on January 31, 1842. He was only 30 years old, but had already published Sketches by Boz, The Pickwick Papers, Oliver Twist, Nicholas Nickleby, and Master Humphrey's Clock. I can do nothing that I want to do, go nowhere where I want to go, and see nothing that I want to see. If I turn into the street, I am followed by a multitude. If I stay at home, the house becomes, with callers, like a fair. ... I dine out, and have to talk about everything to everybody. ... I take my seat in a railroad car, and the very conductor won't leave me alone. I get out at a station, and can't drink a glass of water, without having a hundred people looking down my throat when I open my mouth to swallow. Other nineteenth-century visitors to the United States were equally impressed by the picturesque landscape. 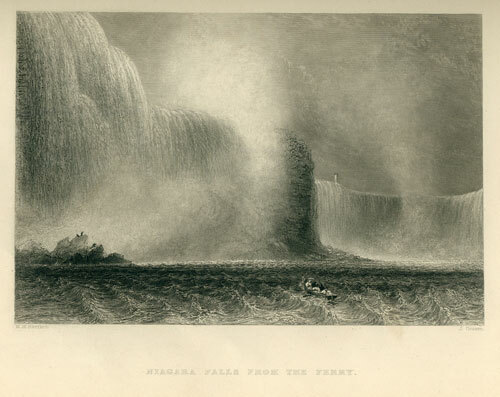 Nathaniel P. Willis' American Scenery (published in London in 1840) includes William Bartlett's image of Niagara Falls, just as Dickens would have seen it two years later.